This terrific review by Dr. Claudia Rousseau in the Gazette newspapers discusses the paintings of Anamario Hernandez's recent show a year ago or so in Bethesda's Orchard Gallery. Like most of Rousseau's art criticism, it's an elegant and erudite piece of writing from this well-traveled and experienced art scholar. But the key issue here and what this review triggered in my mind is an interesting thing that is happening associated with this small, unassuming gallery and frame shop at 7917 Norfolk Avenue in Bethesda. 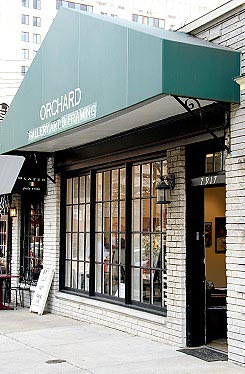 Most of you have probably never heard of Orchard Gallery because as far as I know it has never been written about in any of the local press. I have written about it a few times, but never in depth. Part of that is because the owners, a very nice and unassuming Korean couple, don't seem to be too concerned with the press. As far as I know, they don't even send out press releases (at least to me), although they do participate in the monthly Bethesda Art Walks. But they are doing something right that seems to have escaped most galleries these days: they are selling a lot of artwork. When I first walked into Orchard a few years ago, I was expecting to find the usual mediocre art that one finds on the walls of most art venues that rely on framing as a business. I was pleasantly surprised not only by the quality of the artwork (at the time they were showing a recent MICA MFA graduate whose name escapes me now), but also by the fact that the framing business does not interfere with the art gallery space at all. It's a clean, minimalist art space. The owners were very nice and warm, and were genuinely surprised when I identified myself (they had no idea who I was anyway), described what I do, and then told them that I really liked the work. I also noted that there were a lot of red dots. Over the next couple of years, every time that I find myself around Norfolk Avenue, I drop by into Orchard to check out their shows. I haven't been WOW'd every time, but I've never been disappointed. It is clear that the owners have a particular taste and sensibility that is working for them. And I've always seen a lot of red dots. So after reading Rousseau's review I reached out and try to gather some info on this gallery and the one constant that comes back is that they're selling artwork. A recent show with a price point of $3,000 - $4,000 a piece sold out and the current show (I am told) is selling well. What's even more refreshing is that in these times of austere fiscal environments, when galleries are closing all over the nation, and where they turn away new artists by the droves, Orchard's website still says: "We encourage local and emerging artists to contact us for details on our monthly gallery exhibits." Orchard, my kudos to you. Keep doing whatever you are doing to put original artwork on peoples' walls. Update: Read Rousseau's review of the most recent show at Orchard here. The victims took turns standing at a lectern in State Supreme Court in Manhattan and calling for a harsh sentence. And in the end, despite a tearful plea for mercy from the defendant, Justice Michael J. Obus ordered Mr. Salander, 61, to serve 6 to 18 years in prison, the maximum term agreed upon in the plea arrangement. He also ordered Mr. Salander to pay more than $114 million in restitution, but acknowledged that it was unlikely that Mr. Salander would be able to come up with that sum.